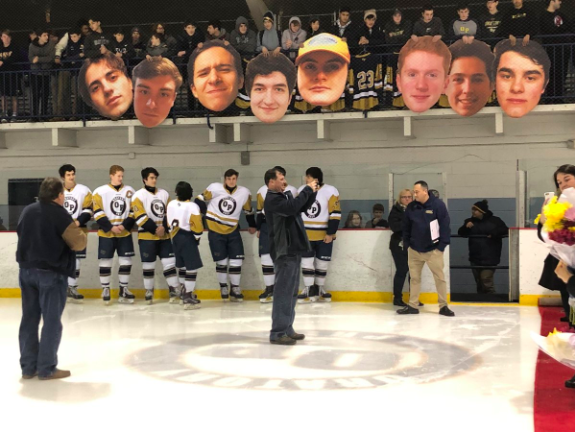 January 18, 2019, was a big night for all the Seniors on Oratory’s hockey team. The hype around the game, the crowd size, and the energy in the arena gave the game an even greater feel. But to one senior, this game was more than just Senior Night. To the team’s captain, John Meehan, this game was personal. It was against his hometown team, the Morristown Colonials. John was playing against his fellow townsmen and many friends. I sat down with him following their huge victory which at times seemed anything but certain. For those who missed it, I tried to recap the game in the simplest (and most dramatic) way possible. At times in the first period, it seemed Morristown was unstoppable. They had a 3-0 lead, a huge shot on goal advantage, and had every bit of momentum on their side. The Rams did not break. After two unanswered goals to bring them even closer, Morristown extended their lead to 4-2 into the second-period intermission. The Rams did not break. Morristown held that same two-goal lead with nine minutes to go but that did not phase the Rams at all. After fellow senior James Crapser scored to make it 4-3, the shoulder-to-shoulder OP fan section felt that an equalizer was inevitable. After a hard fought eight minutes, the Rams tied it up behind now 100 point scorer John Spitznagel with less than 2 minutes. As the crowd erupted, the Rams decided they would not finish this in overtime, they were going to finish the game right then and there. Moments after the equalizer, another senior won the game for the Rams. This time it was Dominic Maida joining in on the scoring. The Union Sports Arena crowd went into a frenzy and in a fitting ending, Senior Captain John Meehan who had three points scored to put the final nail in his hometown team’s coffin. Thank you to John for taking my questions. Joe: John, congratulations on your win on Senior Night. Considering everything about this game (being against your hometown, and it being your senior night) was this the biggest win of the year, if not your entire hockey career? John Meehan: In my personal opinion, I feel that this was the biggest win of our season and of my hockey career at Oratory. It was a game against a Mennen Cup team, the highest public school division in our area. The game gave us proof that we can play against teams like that! For me, it was great to win a game like that against my hometown, as I have waited for that game to happen for the past 4 years. Joe: With that being said, what was your reaction to immediately going down 3-0? John Meehan: Initially, I had a feeling that we would put up a huge fight to come back, which we did. After we scored our first, I felt confident from there. We always have a drive to come back within us, and it has been very common that we do it successfully. Joe: The stands were packed and the crowd was into it the whole time. How instrumental was that into stringing together your comeback? John Meehan: In terms of the crowd at the game, I definitely feel that it gave us more motivation to come back. We did not want to let a 3 goal deficit shape how the rest of the game would be played, and we did not want to give up in front of our classmates. We had the drive in us, and scoring 4 goals in the third period was proof of that. Joe: Finally, what can we expect from the team at the end of the season? John Meehan: I expect that we will be playing some very good and improved competition, preparing us for conference playoffs and states. It is truly how we perform in these last couple games that will shape the postseason for us in terms of the drive and desire we will have to win. Also, for us seniors, it is our last chance to win a conference championship, where we have lost in the championship the past two seasons.